Managing a complex, hybrid IT environment can require multiple management tools, redundant policy implementations, and extra staff to handle the operations. If this maelstrom sounds familiar, there is an alternative: utilizing a unified management platform to simplify operations and provide consistent user experience and functionality. 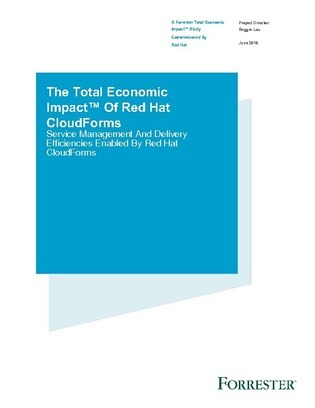 In this report, Forrester Research performs an in-depth economic analysis of Red Hat CloudForms, evaluating the benefits, costs, risks, and long-term flexibility of the multi-environment management platform. Read on to see the full results, which include an examination of the CloudForms’ ability to accelerate service delivery, automate policy reinforcement, and more.